We are excited to announce Terrain Tiles on AWS, a new AWS Public Dataset that makes global digital elevation models (DEMs) available for anyone to access from Amazon Simple Storage Service (Amazon S3). DEMs provide a way to examine the elevation of the Earth’s surface and are available as terrain raster tiles. We connected with Mapzen, an open, sustainable, and accessible mapping platform which lets you display, search, and navigate our world. Mapzen gathered the elevation data from various public sources and is making it easy for startups, enterprises, and research institutions to access and use via Amazon S3. Elevation data has been one of the top public dataset requests, so we are excited about the recent launch. Making Earth observation data available in the cloud is accelerating scientific discovery and enabling the creation of new products. Read our interview below with Mapzen about the newly released dataset and how they run entirely on open-source tools and are powered by open data. What are terrain tiles? What sort of geospatial data are they providing? 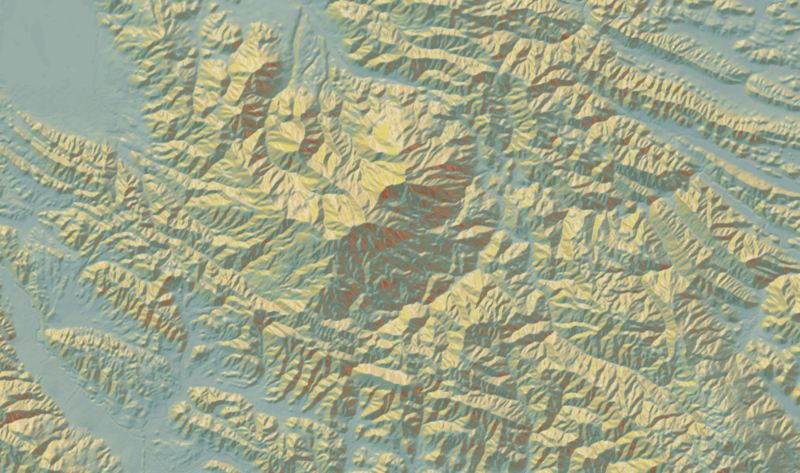 Terrain tiles provide open elevation data for the entire world in a raster tile format. By aggregating, standardizing, and tiling multiple source datasets into common web mapping and desktop GIS formats and dimensions, it’s much easier to process the data and build applications on top of it. Each square-shaped terrain tile contains a grid of elevation values. For example, the grid cell for Mount Everest would has a value of 8,848 meters above sea level, while the grid cell for Challenger Deep has a value of 10,994 meters below sea level. If you are familiar with digital elevation models (DEMs) or digital terrain models (DTMs), then you’ll be interested in terrain tiles. Tiles are available for zooms 0 through 15 in several spatial data formats, including PNG and GeoTIFF tiles in web Mercator projection, as well as SRTM-style HGT in raw latlng projection. A derived “normal map” product is also available, which precomputes math on the server so your mobile phone doesn’t overheat and can be combined with renders like Tangram to generate spheremap-based hillshades and real-time 3D scenes. With terrain tiles, you have the power to customize the content and visual appearance of your map on the fly and perform complicated analysis on the desktop or in the cloud. We’re excited to see what you build! Where does the data for the terrain tiles come from? Mapzen aggregates elevation data from several open data providers, including 3 meter and 10 meter 3DEP (formerly NED or National Elevation Dataset) in the United States, 30 meter SRTM globally, and coarser GMTED zoomed out and ETOPO1 to fill in bathymetry – all powered by GDAL VRTs, and some special sauce. We’d love to add additional detail in your area, so send us data source tips! Why did you decide to make the terrain tiles publicly available? Mapzen is committed to making all of our data and mapping solutions open and available to the public because we believe doing so will encourage innovation amongst developers and designers looking for greater personalization and control in their mapping capabilities. Through the open community, we’re able to offer a level of flexibility and accessibility not currently present in the industry today, without the costs associated with leveraging existing infrastructures. Even without the big budgets, developers and entrepreneurs of all sizes can incorporate our mapping functionality into whatever they are working on. Can you provide an estimate of how much data you’re creating? How has working on AWS helped you to handle this amount of data? The total file size of all the tiles Mapzen has created is around 51.5TB. Working on AWS has allowed us to store over 4.6 billion tiles easily in S3, without having to worry about provisioning redundant storage ourselves. Moreover, S3 serves as a platform for efficiently distributing the tile data to users, greatly simplifying deployment and maintenance of such a service. How are you using terrain tiles in your own products internally? Mapzen uses terrain tiles internally for our elevation lookup service and Walkabout map style. We will also be using the tiles for our upcoming terrain tile service and Tron map style. How do you expect others to use terrain tiles in their own workflows? Thank you, Mapzen, for your work making this data available to the public! Learn more about Terrain Tiles on AWS and access the Landsat and NAIP public datasets. In November 2017, Mapzen added several newer, higher resolution sources covering Alaska and the Arctic, Austria, Canada, the European Union, Mexico, New Zealand, Norway, and the United Kingdom. This update was powered by improved software using more AWS products, including AWS Batch, AWS Lambda, and Amazon S3. In addition to updating the software and data, they also added support for 512 pixel tiles and buffered tiles at 260 and 516 pixels to the Mapzen Terrain Tiles service. Learn more.